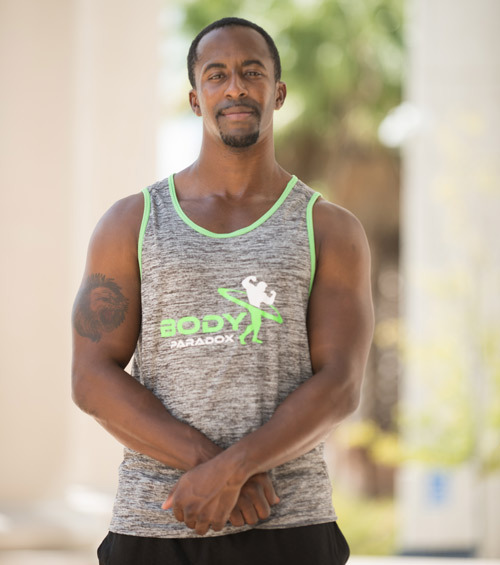 Nemiah Rutledge is the founder and owner of Body Paradox. He has an Associate of Arts degree in occupational science. He’s worked as a personal trainer since August 2013 at Set Performance, then Workout Anytime. While earning practical experience and refining his program at these gyms, he began developing a business plan and creating the branding for his own fitness training business. He formed Body Paradox in 2015 and soon after, became the official corporate training company for Harrell & Harrell, P.A. The firm remains his largest client, but he also works with Baptist Health, and a wide variety of smaller businesses. He employs a capable team of certified trainers who round out the Body Paradox team to bring a wide variety of personal, group and corporate training to First Coast businesses and residents. In summer of 2016, Rutledge also completed a personal goal, placing in his first natural body building competition – the Southern Cross Naturals Florida Championship. Get started today, call 904.962.1797 or contact us online.